What we have works…why should I consider? There has been a shift in the thinking of many corporations when it comes to personnel-related support functions, Fortune 500 companies and smaller firms alike. This shift is to their “core competency” and involves outside contracting of support functions not associated with a company’s core business. This move towards core competency is especially prevalent with security services. Organizations of all types which regularly entrust the safety and security of their employees, customers, and assets are more often than ever looking to reputable security service vendors to maintain comprehensive security programs. In today’s world an effective security program is no longer a simple officer in a uniform! The threats and security concerns of modern society call for highly proactive security programs which include: comprehensive training programs with essential site/industry specific training as well as emergency/disaster planning. STT has the experience and diverse clientele background necessary to provide our customers with customized programs built with insight from all types of situations. Many organizations think that by using a contracted security company they will lose control over their security department. This is not the case with STT as your service provider. All aspects of an STT Security program, including training and site specifications, are developed and modified, on an as needed basis, in conjunction with our clients to fit their needs and accomplish their goals in the most cost effective manner possible. STT provides documented training and contract compliance audits on a regular basis to ensure this. Everything we do will be customized for you! Quality companies, like STT, also offer competitive benefits and wages and benchmark-setting training and employee development programs. Many Security Managers fear that switching to a contract provider will mean they are of decreased value to their company, have less direct control over the program, and could potentially lose their jobs. However, a shift to contract security can have the opposite effect. Security Managers who outsource their security program often find they no longer have to spend long hours dealing with the day-to-day burden of managing security officers, and instead, they are able to offer their skills in more effective ways such as creating site specific cost reducing programs, creating disaster and emergency plans, and increasing the overall effectiveness of their security program. This increases their value to the company while decreasing their security headaches, as they can defer security personnel functions to the contract security firm’s management team. Switching to a contract security company does not mean losing your well-established security force, contract companies will usually retain as much of the existing staff as desired as long they meet the required qualifications and company standards. We will work with you to ensure a smooth transition. Why are companies considering ? With more and more companies competing for market share and doing so with enhanced technology, it is imperative to have a workforce that is almost entirely focused on improving a company’s core business offering. For example, a roofing material manufacturer most likely will not improve its position in its markets due to the efforts of its in-house security officers. High level managers are more and more often deciding to utilize reputable contract security firms, like STT Security Services, to be their security experts so they can focus on their company objectives. Payroll taxes and fringe benefits have skyrocketed to a national average of 48%. As our society becomes more and more litigious, the risk of liability from in-house personnel-related issues is steadily increasing. Areas of risk to consider include: Workers Compensation, Unemployment, Discrimination, Sexual Harassment, Wrongful Termination, and General Liability. STT will place your company as a co-insured and be covering the first 5 million on all claims! Lawsuits are costly and time-consuming. Due to this ever increasing expense and risk of greater hidden cost, companies are choosing to protect themselves by outsourcing highly risky functions like security. 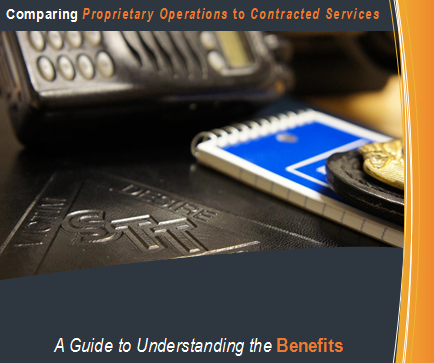 10 reasons to consider a STT contract security program partnership today..
Understanding the complete costs of your current operations will allow STT to evaluate and explain in more detail why a contracted option may make more sense for your organization. In most cases, the cost of a contracted security program is comparable or less than a company’s proprietary security program budget. However, the additional protection provided, combined with the elimination of other hidden costs actually serves to reduce a company’s long-term expense. Additional costs can include overtime wages, uniforms, recruiting and background checking expenses, training, administration personnel for payroll services and depreciation of equipment. The form below will help us analyze the actual costs of your security program and allow STT to develop an “apples to apples” cost scenario for you.